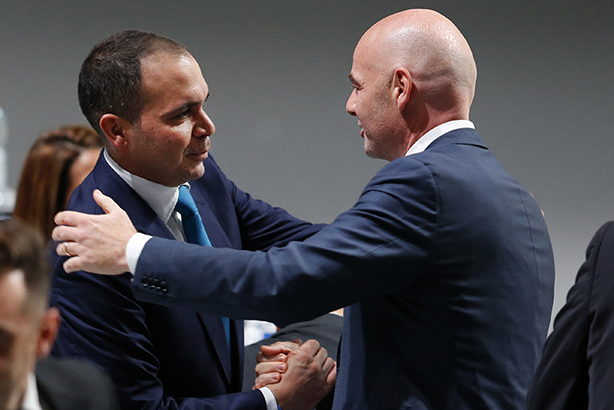 The PR adviser to unsuccessful FIFA presidential candidate Prince Ali of Jordan has told PRWeek that the global football governing body's members "chose to stay the same" by choosing the head of European football body UEFA as its new president. UEFA general secretary Gianni Infantino won the vote in Switzerland on Friday with 115 votes from Asian Football Confederation president Sheikh Salman's 88 votes. Prince Ali won just four votes. The Guardian wrote last year that Jordan Football Association president Prince Ali was "seen as the reformist candidate", while the Financial Times saw him as the frontrunner for the job in an article at the start of this year, saying he vowed to "clean up" FIFA. Shimon Cohen, chair and founder of London agency The PR Office, who advised the prince through his campaign, said: "There were two things on offer - one was stay the same, more of the same, and the other was change. We campaigned on a platform that sought openness, transparency, change and reform. FIFA members chose to stay the same and that is disappointing, but it is what it is." Cohen said he hoped that in order to improve FIFA's reputation, some of Ali's manifesto commitments might be taken up by Infantino - namely the creation of an independent oversight committee of FIFA, the publication of executive salaries and the publication of minutes of key meetings. FIFA spent much of last year battling to defend its reputation - the body appointed PR consultancy Teneo in the summer as it sought to deal with an ongoing crisis involving arrests, allegations of corruption and confusion as to whether or not then president Sepp Blatter had actually resigned. Four major sponsors later called for him to depart, as criminal proceedings were mounted against Blatter. "If the new president adopted Prince Ali’s manifesto in that regard, then some progress would be made," he said. However, Cohen said that despite the wide margin of defeat, the election process had helped Prince Ali's standing. "We had to ensure that Prince Ali’s reputation remained intact, win or lose - and he came top of every public and media poll, every single poll," he said. Cohen will continue to advise Prince Ali ahead of the Under-18 Women's World Cup, being held in his home nation in the autumn, saying the prince was "passionate" about women's football. Cohen, who had worked with Prince Ali since last year, said of the campaign: "It was the most fascinating experience - as a football fan, disappointing, but then do turkeys ever vote for Christmas?"